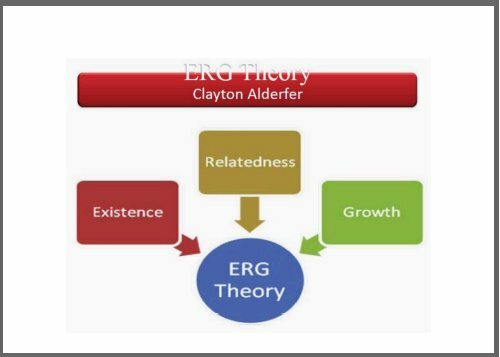 The ERG Theory was proposed by Clayton P. Alderfer in 1969 in a Psychological Review article entitled "An Empirical Test of a New Theory of Human Need". The model was developed in his book: "Existence, Relatedness, and Growth; Human Needs in Organizational Settings" [currently out of print]. The theory is a response and reaction to Maslow's famous "Hierarchy of Needs" theory, and reduces Maslow's 5 levels of need to just these 3 categories (Existence, Relatedness, and Growth). Existence Needs co-relate to Maslow's first two levels. This group of needs is concerned with providing the basic requirements for material existence, such as physiological and safety needs. In a work context this need is satisfied by money earned in a job for the purchase of food, shelter, clothing, etc. Relatedness Needs co-relate to Maslow's third and fourth levels. This group of needs focuses on the desire to establish and maintain interpersonal relationships with family, friends, co-workers and employers. This need includes the need to interact with other people, receive public recognition, and feel secure around people. In a work context and given the amount of time most people spend at work this need is normally satisfied to some extent by their relationships with colleagues and managers. Growth Needs co-relate to Maslow's fourth and fifth levels. These needs are about the fulfilment of desires to be creative, productive and to complete meaningful tasks in order to build and enhance a person’s self-esteem through personal achievement. These needs are all about by personal development. In a work context a person's job, career, or profession can provide a significant satisfaction of growth needs. Contrary to Maslow's idea that access to the higher levels of his pyramid required satisfaction in the lower level needs, Alderfer maintained that the three ERG areas are not stepped. Thus ERG theory states that an employee’s behaviour is motivated simultaneously by more than one need level. For example, satisfying your growth needs by completing a project on time even though your relatedness needs aren’t especially satisfied. ERG theory applies the satisfaction-progression process described in Maslow's famous "Hierarchy of Needs" theory, so one need level will dominate a person’s motivation more than others. As existence needs are satisfied, for example, related needs become more important. 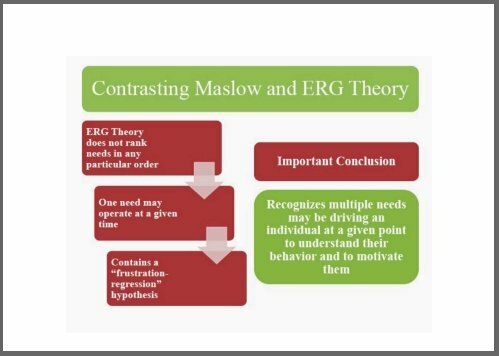 But, and it's a big "but", unlike Maslow’s model, ERG theory includes a frustration-regression process in that the inability to satisfy a higher need causes frustration and a regression to the next lower need level. For example, if existence and relatedness needs have been satisfied, but growth need fulfillment has been blocked, the individual will become frustrated and relatedness needs will again emerge as the dominant source of motivation. Also, taking the frustration-regression process one step further, the ERG theory acknowledges that if a higher level need seems to be too difficult to fulfil, the person may regress to lower level needs that appear easier to satisfy. Clearly this frustration-regression concept has an impact on workplace motivation and especially in a change situation. So if growth opportunities are not present or apparent, people will probably regress to relatedness needs, and socialise more with co-workers - which in a change situation can create a breeding ground for speculation, gossip and resistance. ERG Theory recognizes that the order of importance of the three categories may vary for each individual depending on the circumstances experienced by the individual and also how the individual perceives the circumstances. 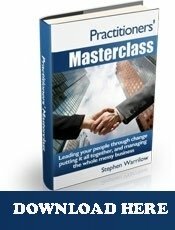 According to ERG theory, focusing exclusively on any one need at a time will not optimise effective motivation. The leadership and management implications of this are that change leaders need to recognise that people have multiple needs to satisfy simultaneously. There seems to a general concensus that ERG theory provides a workable explanation of the dynamics of human needs as experienced and expressed in organisational situations. The theory is less rigid than Maslow's famous "Hierarchy of Needs" theory, and Human needs cluster more neatly around the three categories proposed by Alderfer than the five categories in Maslow’s hierarchy. In my view, a key change leadership skill is knowing how to reframe a difficult situation in such a way that even though there are [or could be] threats to existence needs, people are motivated by addressing their relatedness and growth needs. An obvious and extreme illustration of this is the wartime political leader of military leader. Longer term, it is [in my view] the responsibility of the change leader to create, stimulate, sustain values and beliefs that will foster and engender relatedness and growth as the norm, and to integrate them into the organisational culture. Return from ERG Theory to "Define Motivation"